As president-elect Barack Obama waits to take over the administration of the US, he faces daunting challenges on both the domestic and foreign fronts. The expectations both within and outside the country are very high. In his post-victory speech, Obama cautioned that change will take time. Some of his efforts may prove anti-climactic. 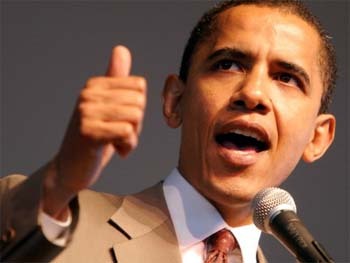 People all over the world are expecting big things from Obama as he ran a campaign as an agent for change. While fixing the broken American economy will be Obama's number one priority, he will simultaneously immerse himself in reducing tensions around the globe. As promised, a gradual withdrawal from Iraq is to be expected. As the war in Afghanistan is smoldering on without any tangible results, Obama will focus on that area. As Al Qaeda adherents have found a sanctuary on the Pakistani side of the border, every effort will be made to get the cooperation of Pakistan. During the campaign, Obama was clear on the use of American military force to get rid of the terrorist threat from the Afghanistan-Pakistan border if Pakistan is unwilling or unable to prevail on the terrorists. The fight against terrorism is a global phenomenon. India has been afflicted by a terrorist threat for the past two decades. India's efforts to rein in terrorists on the western and eastern borders have so far been unsuccessful. India can enlist American help is combating terrorism. During the last eight years the Bush administration has forged a strategic alliance with the Indian government. President-elect Obama will build on nurturing the Indian-American alliance. As a major emerging economy and the largest democracy, America will continue to enlist India's participation in tackling global terrorism, climate change and poverty. While there is some concern in India about the policy of the new Obama administration on Kashmir, India need not overly worry about American pressure to solve the Kashmir problem. As it stands Pakistan is vulnerable to American influence since its economy is in tatters and domestic terrorism is threatening the national security of the country. The best way to reduce tension between India and Pakistan is to encourage trade between the two and observe the Line of Control on the Kashmir border. The Pakistani leadership understands this ground reality. It is in Pakistan's vital interest to establish cordial relations with India. In an interview in the New York Times, Pakistan's President Asif Ali Zardari stated: "We want better ties with India and there is no other economic survival for nations like us." The Bush administration deliberately ignored global climate change mainly because adopting strict emission controls wound have caused a heavy financial burden on domestic industries. Global warming will be one hot button issue that the Obama administration will strive to address. Here India and China may not completely back global efforts if they lead to reduced growth. A surefire way to poverty alleviation is to encourage free trade. If America and the European countries can agree on abolishing subsidies given to domestic farmers, emerging countries like China, India and Brazil are likely to agree on reducing the tariff on industrial products. During times of recession there will be calls by politicians for trade protectionism. This can adversely affect developing countries and may lead to higher inflation. Reduced US imports can have serious consequences for developing countries. Obama has hinted at abolishing the existing tax break that American companies enjoy when they outsource their operations oversees. India has been a beneficiary of outsourcing in the technology sector. Obama also promised tax breaks for companies that create jobs in the US. Yet outsourcing has helped the bottom lines of many major corporations and there is no sign that the process will slacken in the near future. One area that India can engage the Obama administration in is to invest in infrastructure development. Indian ports, airports, roads and bridges beg for immediate modernization. Without infrastructure development, further growth of the Indian economy will be handicapped. State governments in India should provide a stable, business-friendly environment for foreign direct investment. Opportunities exist to further cooperation between India and the US in areas of space research and medical research. India can emerge as a major centre for basic and clinical research in medicine providing jobs for thousands of people. Because of financial constraints, India's medical research has lagged behind countries in the West. By building alliances with various American universities, India can improve higher education. Some policymakers have suggested increasing the current cap for H1-B visa for foreigners with technical degrees from 65,000. An additional 20,000 H1-B visa will be issued to those aliens with a master's level degree from US universities. The captains of major US companies have urged Congress to increase the cap. The thought is technically skilled new arrivals will help spur the moribund economy by buying up houses. Any increase in H1-B visa should be helpful to Indians eager to migrate to the US. The India-US nuclear accord had the support of Senators Obama and vice president-elect Joe Biden. Since India is not a signatory to the Nuclear Non-Proliferation Treaty, the new administration is likely to bring up this topic. India is unlikely to change its position, considering its national security interests. With the existing geopolitical conditions America will need India's support for dealing with terrorism, climate change and nuclear proliferation. This is a far cry from the situation that prevailed when India gained independence 60 years ago.